Before anyone buys a folding saw, they should take a few moments to determine what they need it to do. The best folding saw a person can buy is one that will do what the tasks that have to be done. There are models which are better suited for bush-craft, and there are models which are better suited for household landscaping needs. While they can be interchanged in certain circumstances, it’s always best to get the right tool for the job. With that consideration in mind, I’ve decided to find ten of the best folding saw models that I could find. Some of these saws are more suitable for landscaping and others will best serve hunters and survivalists. Either way, there is at least one model among these ten that will be suitable for anyone. Designed with the needs of survivalists, campers, and hunters in mind, this compact saw is designed to give the user exactly what they need to cut through smaller branches and brush. It has an 8.25-inch high-carbon steel blade that’s been coated with a black powder coat finish so that it resists corrosion and extends its service life. It also has deferentially tempered teeth that work equally well on green wood as it does on softwood and hardwoods. This model has an overall closed length of 9.5-inches and comes with a handy nylon sheath with a loop attachment. This tool is best used by individuals who need a tool that makes short work out of their landscaping work. It’s designed with a 7-inch saw blade with triple-ground teeth that are capable of cutting through wood faster than other comparable saws and without wearing out the user’s arm. It’s an ideal model for cutting down tree limbs that may be too thick to tackle with a lopper and is equipped with a non-slip grip that makes it easy to hold and use. This combination of blade sharpness and overall design allow this product to handle a number of jobs around the yard. This tool is designed with two different blades, one which is suitable for cutting through wood and one which is suitable for cutting through bone. It has a blade length of 7.1-inches that can be locked in either the open or closed position and the entire saw has an overall length of 14.2-inches. This product comes with a nylon sheath that has two pockets on it that can be used to hold 6-inch sharpening files, although none are provided with the saw. All of these features ensure that this tool is useful for anyone who spends considerable time outside, whether they’re camping, hiking or backpacking. This 10-inch survival saw with a curved blade is suitable for cutting wood for a variety of different tasks, including building a survival shelter or for cutting wood to be used for fuel at a campsite. Since it has a curved blade, it doesn’t bend as easily as some other types of saws and gives longer cutting strokes which then equates to faster cutting times. This saw has a high-carbon steel and its shank travels down 75% of the handle for durability. This is a tool that’s designed to be taken out into the wilderness and used on a regular basis. This saw is designed to be used by not only hunters but any outdoor enthusiast who needs a sturdy tool to cut wood with while they’re out in the woods or out on the trail. It has a handle that’s made of nylon and has a rubbing coating that gives the user the grip necessary to use it effectively. This tool’s blade folds quickly and quietly into position so it can be ready to cut wood at a moment’s notice. Its 6-inch blade has offset teeth and a push-button lock. Overall, this tool is ideal for taking out on camping trips, placing in a backpack while hiking or for taking out on hunting trips. This high-quality pull-cut saw can be used for cutting through wood, PVC, and bone. This makes it an implement that can be used for both home landscaping use or for use while camping or hunting. It has an 8-inch blade that’s designed to be used in the Japanese style of sawing by pulling it. This model has an ergonomic handle that fits comfortably in most people’s hands and is slip-resistant so it won’t fly out of the user’s hands while they are sawing. All of these features make this a good product for landscapers, hunters, campers, and hikers. 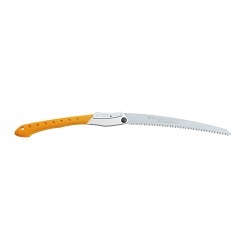 Equipped with a blade that was designed for pruning and can cut branches up to 4-inches in diameter, this hand saw is a good tool for homeowners and landscapers. It has a curved blade which fits close to logs and helps keep the cutting action as efficient and effective as possible. It cuts on the draw strokes and can tear through a variety of different woods including not only softwoods but also hardwoods as well. It’s a product that’s also easy-to-use because all the user has to do is to flip the lock and then extend the blade to lock it in the open position. Capable of easily cutting through small to medium-sized branches 5-inches to 6-inches in diameter, this saw is useful for a variety of different wood cutting projects including pruning, cutting firewood or clearing overgrown trails. Its 10-inch blades have up to 6-teeth per inch and each saw-tooth has 3-sides for more efficient cutting. This product also has a comfortable and ergonomically designed handle that’s easy to hold and won’t tire out the user’s hand during sawing jobs. This saw is designed to provide performance each and every time it’s used and to have a long service life. Manufactured with a 7.5-inch blade that’s specially coated to help it prevent corrosion and has 7-teeth per inch, this saw is designed for a variety of different wood cutting tasks. It’s also equipped with a plastic handle with a leather strap. For safety, this unit is equipped with a safety lock that locks it in and locks it out. All in all, this general purpose saw is capable of cutting through both green woods and hardwoods, bone, and plastic. This makes it a useful tool for keeping around the house or for taking out into the wilderness. Professional landscaping jobs require professional tools and that’s exactly what this landscaping saw provides. It has a 14-1/5-inch blade length and a blade thickness of 1.8mm. It has 5.5 teeth per inch and is capable of doing a variety of pruning and trimming jobs. It’s designed to handle large limbs and small tree trunks but it can also be used for a number of different construction products as well. This saw is probably the closest that any manual saw could come to the cutting power of a chainsaw and is designed to provide the user with years of use.